Jeff Bezos is the richest man in the world, with a net worth in the realm of $160 billion. Money like that, wielded philanthropically, can alter the shape of the world. Bill Gates is already doing that, with his anti-disease efforts worldwide. Andrew Carnegie did it by donating nearly 3,000 libraries to towns and cities around the world. Now, Bezos is making a run at it, with a $2 billion donation to his new “Day 1 Fund”—a two-target foundation to aid low-income communities. One branch is earmarked for homeless families, the other for preschool education. The first half, called the Day 1 Families Fund, is inspired by a nonprofit in Seattle. Mary’s Place, a family-oriented homeless shelter, has the vision statement of, “No child sleeps outside.” The Fund will issue grants and awards to organizations providing shelter and food to young, impoverished families. The second half, the Day 1 Academies Fund, is more hands-on. It will operate a network of “tier 1” full-scholarship preschools in low-income areas. 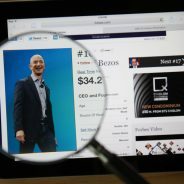 Bezos has been open about his desire to operate both branches like a business as opposed to a nonprofit. This decision has drawn a reasonable amount of criticism from the public. In a tweet posted on September 13, Bezos explicitly called his potential students “the customer,” which many say shows that he inherently misunderstands education and the way that schools work. Nevertheless, this type of donation can still do a tremendous amount of good. Thus, the public has begrudgingly tolerated his faux pax. On the same token, it’s also worth noting that $2 billion is a drop in the bucket for Bezos, as it equals a mere one percent of his assets. But it does mark a large upswing in his charitable giving; previous known donations from himself, his wife, and family only amounted to $135 million, a paltry 0.0008 percent. Hopefully, his latest donation marks the beginning of a new trend.